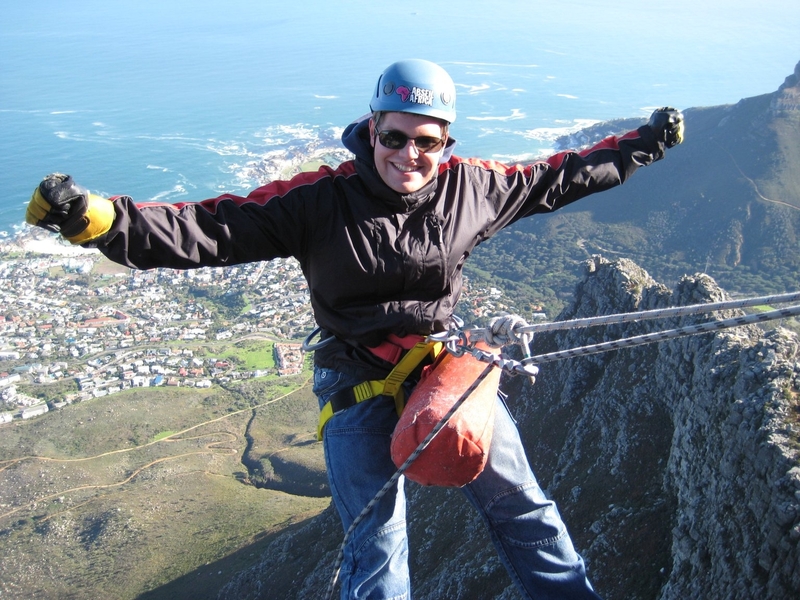 Abseiling off extreme overhanging cliffs, is a totally safe, very exciting, outdoor adventure. Abseiling is tons off fun. Step off the top, at 1000 metres above sea level, and Abseil into pure vertical space. This is the world’s original highest commercial abseil. You are surrounded by awesome views and the deep blue Atlantic at your feet. We operate on a daily basis weather permitting between 10am and 3pm. Overall experience will take about 45 min to an hour. Included in that time frame is demonstration of the Abseil, putting on the equipment, doing the abseil and a short hike to get back on top of the mountain. The long drop, a 112 meter trip into oblivion – this is the highest commercial abseil in the world, of Cape Town’s famous Table Mountain. The views are incredible!! Operates 7 days a week, weather permitting, so book in advance, but it is always advisable to phone us before you go up Table Mountain to make sure the weather is ok.
P.S. Please be advised that you need to confirm weather situation before departing to do your abseil!